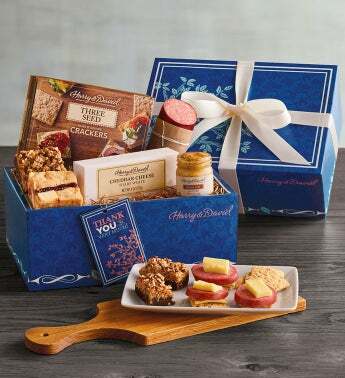 This impressive gift box, which features an attached "Thank You" hangtag and comes wrapped in a beautiful white ribbon, is a great way to say and show how much you appreciate someone. Inside is a white chocolate bar and a German chocolate cookie bar—both crafted here in our candy kitchen—along with white sharp cheddar cheese, hickory-smoked summer sausage, three-seed crackers, and honey hot mustard. Part sweet, part savory, and all amazing.